Plumed goldenrod is a common North American wildflower, often seeded as part of native plant mixes. They pop up on roadsides and fields in nearly every state, but they are useful in landscaped meadow plantings, as well. Plumed goldenrod is one of several common names applied to the Solidago genus. They are native perennials with golden-yellow flowers that emerge in early fall, a time when most other flowering plants have faded. The flowers appear on lanky stalks three to five feet in height. The tiny individual blossoms are grouped together as large drooping clusters that cause the stalks to bow and sway gracefully under their weight. Goldenrods are sun-loving plants that grow well in almost any soil type and are quite drought-tolerant once established. 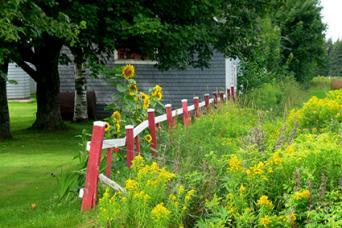 Because goldenrods grow well in disturbed soil, they are useful for re-vegetating road cuts and construction areas. 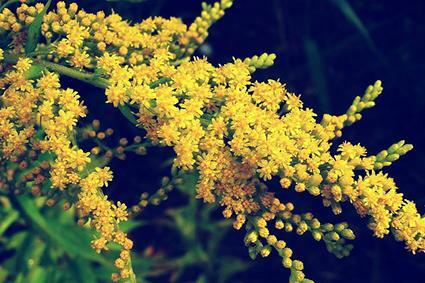 Though it is most commonly used in informal meadow plantings, goldenrod can also be used in perennial borders and is a great choice for butterfly gardens. Due to it's somewhat gangly growth habit, it's not the type of plant that is typically grown by itself. It looks much better when mixed in with other flowering species of varying sizes and growth habits. It is particularly attractive when combined with purple aster, another native wildflower that blooms at the same time. Plumed goldenrod is typically seeded directly where it is to grow in fall. The tiny seeds are spread directly on the surface (usually as part of a mix), as they need light to germinate. Keep the planting area moist to assure speedy germination. If you're planting over large areas, it's generally successful to allow natural rainfall to do the work of irrigation for you. They will flower in the second year after planting and should need no further irrigation except during extended droughts. For use in more formal flowerbeds, purchase potted plants or produce your own by sowing seeds in flats and transplanting in spring. In this environment, it's worth considering one of the ornamental cultivars that are occasionally available in nurseries, as these plants have a more compact and attractive growth habit. Solidaster, Goldenmosa and Lemore are among the most commonly available. The only form of maintenance needed is to cut the flower stalks to the ground after they flower. They dry up and turn brown while the plant overwinters underground. In large meadow plantings it is most practical to mow the entire area with a high-clearance mower. 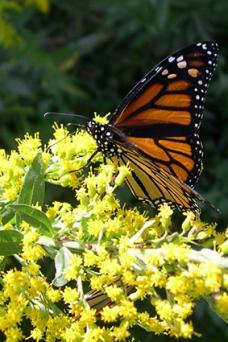 As robust native plants, goldenrod is rarely troubled by pests or disease. The only challenge they may pose to gardeners is seeding themselves where they are unwanted. Fortunately the seedlings are easily pulled by hand. 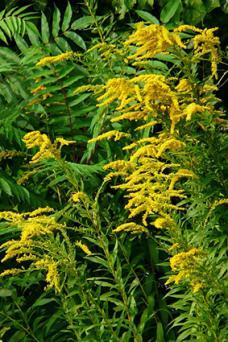 The color of plumed goldenrod is perfect for fall. With their showy nectar-rich blossoms and minimal care requirements, they are exemplary of the benefits of gardening with native species.